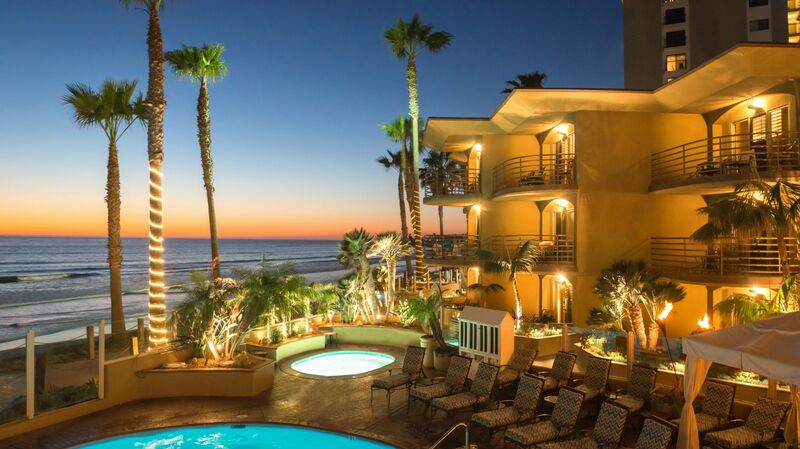 Dramatically perched above Pacific Beach, the 4-Diamond rated Pacific Terrace Hotel provides a front row seat to the sparkling blue Pacific Ocean. Relax, settle in, and get ready to experience the most spectacular sunsets San Diego has to offer. With direct beach access just steps away, bikes, beach chairs and sun umbrellas, Tommy Bahama island-inspired accommodations, a heated oceanfront pool and Jacuzzi, a poolside breakfast buffet on site and charge back privileges at a host of local restaurants, and award-winning personalized service - staying at the oceanfront Pacific Terrace Hotel is just like having your own beach house! Pacific Terrace is happy to extend complimentary hot breakfast for two daily to our USD guests.